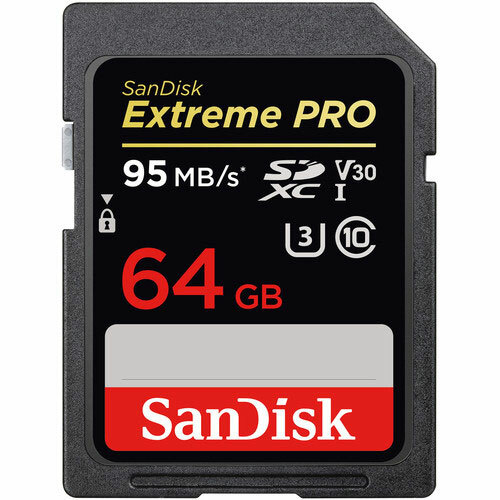 Designed for SD devices that can capture Full HD, 3D, and 4K video, as well as RAW and burst photography, the 64GB Extreme PRO SDHC UHS-I Memory Card from SanDisk has a capacity of 32GB, is compatible with the UHS-I bus, and features a speed class rating of V30, which guarantees minimum write speeds of 30 MB/s. If your device does not support the V30 standard, this card also supports the U3 standard, which also guarantees minimum write speeds of 30 MB/s. Read speeds are supported up to 95 MB/s and write speeds max out at 90 MB/s. SanDisk EXTREME SDHC 32Gb memory card is available for rent or hire from RENTaCAM Sydney.